Want to take a comfortable break from the conference hubbub? Need to recharge your laptop? Have something to share, but for whatever reason you are not scheduled for a concurrent session? Consider stepping up to the open mic at our Digital Sandbox, the UNconference side of the MSET Conference. Or just stop by and listen as your colleagues share their ideas at the MSET Digital Sandbox! Presentation equipment and internet connection will be available. 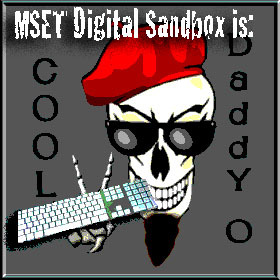 Please sign up here on the MSET Ning by leaving a comment if you're interested in being either a Digital Sandbox lifeguard for an hour, presenter, or both!! It's gonna be the coolest, Daddy-O!